It is currently very popular in my website best singer sewing machines reviews. To say that Singer 9960 Quantum Stylist is a useful machine is an understatement. In reality, this computerized sewing machine simply has everything users will need and so much more. To begin with, it has 600 built-in stitch patterns that include 13 automatic one-step buttonholes and five alphanumeric fonts. To help you customize projects, it has buttonhole under plate, stitch elongation options, and mirror imaging. Singer 9960 Quantum Stylist comes with a number of different presser feet. Those include an overcasting foot, an all-purpose foot, a quarter-inch foot, a cording foot, a blind hem foot, an open toe foot, a buttonhole foot, a zipper foot, an even feed foot, a darning & embroidery foot, a satin stitch foot, and a button sewing foot. As for related accessories, it comes with needles, spool caps, bobbins, a brush, a seam ripper, a sea guide, screwdrivers, a quilting bar, and an auxiliary spool cap. A stitch reference chart is provided right on the machine’s upper lid. It facilitates quicker and easier selection of an appropriate stitch to be used for each project. This is also designed to eliminate tedious screen searching. Meanwhile, the LCD screen provided can be used to obtain stitch information, including length, pattern and width settings of stitches. It even recommends presser foot to be used. A DC motor powers the Singer 9960 Quantum Stylist. The machine comes in an aluminum frame giving it a practical weight and facilitating durability. A unit only weighs about 16.5 lbs or 7.5 kg. Oiling is not required because it has been permanently lubricated. The machine carries a 25-year warranty but with limitations. That duration covers the sewing machine head only. Most electronic components are served with 5-year warranty while adjustments, rings, bulbs, and other attachments come with a year of warranty. Who should buy Singer 9960 Quantum Stylist? Singer 9960 Quantum Stylist is most recommended to professional sewers and designers. Although it can be used by beginners as well, the inclusion of too many features can be overwhelming. Common folks may not easily understand its manual, making it harder to operate. However, after using it for some time, users can easily appreciate and rely on its overall usefulness. Overall, once you get used to it, you will be amazed at how easy it could be used. 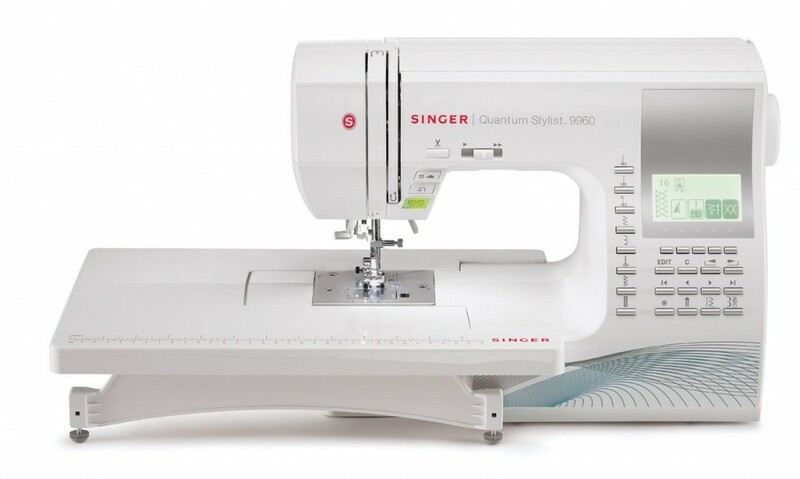 Singer 9960 Quantum Stylist can be used even in thick fabric, which makes it standout compared to other modern sewing machines on its contemporary. Stitches produces are consistent. Different presser feet are included and operations could be quieter. It may be priced with a premium but it is worth the investment.